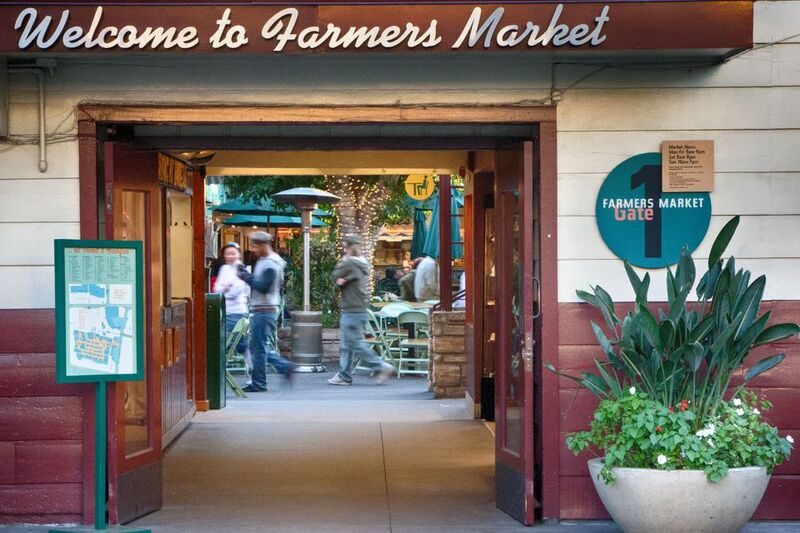 This guide takes you around one of LA's oldest tourist attractions, the Farmers Market. Find out how it got there, what it's like today—and why the gas station says Gilmore. I've tried to capture a bit of the atmosphere and sights that make this place still popular so many years after it opened. I hope you'll enjoy it. The Los Angeles Farmers Market started in 1934 at the corner of Fairfax and Third Street, where local farmers sold produce from the back of their trucks. When such markets were rare elsewhere in the world, tourists soon discovered the impromptu Farmers Market. They marveled all the fresh produce available even in mid-winter. Before long, the Farmers Market grew into a permanent complex of produce stalls. In the 21st century, the Farmers Market is still one of the most popular sights in Los Angeles. It's an official Los Angeles Cultural and Historical Landmark visited by more than 3,000,000 visitors a year. The cream-colored Farmers Market buildings, with their green roofs and brick-colored trim, embrace dozens of small shops and stalls knitted together by a network of passageways. The charm of the Farmers Market lies in unpretentious connection to the past: red vinyl stools and green Formica counters, green-painted folding chairs. The crowd is a combination of tourists licking ice cream cones and Hollywood locals who still come here to buy meats and produce. Hollywood's glitterati have been going to the Farmers Market for years. Walt Disney sat at a Farmers Market table while he designed Disneyland, and today, groups of writers, directors and Hollywood executives may gather for breakfast meetings while old-timers get together for morning coffee. The Farmers Market stays true to its origins, with stalls for butchers and bakers and others selling fresh produce, candies, nuts, and cheese. Magee's, one of the Farmers Market's original merchants, grinds 100,000 pounds of peanut butter a year and the folks at Bob's Donuts begin work at 4:30 AM to make the 1,000 donuts they sell each day. In all, there are 100 shops here with 500 employees (who speak at least 23 different languages). If admiring the produce and food stalls works up an appetite, you can also dine at the Farmers Market in many languages. With five places earning a Zagat food rating of 20 or higher, you'll find lots of great food to choose from, including the Gumbo Pot, a favorite for its Louisiana-style gumbo, red beans and rice and sweet potato salad. The wine bar located near the center of the complex is a great place to pick up a drink and schmooze with locals who come here in the evening after the tourists go home. The Los Angeles Farmers Market has been around since 1934, when enterprising farmers started an informal market at the corner of Fairfax and Third Street, selling produce from their trucks. Tourists soon discovered the impromptu Farmers Market, marveling at the array of fresh produce available even in mid-winter, and the Farmers Market grew into a more formal complex of produce stalls. More than seventy years later, the Farmers Market is still one of the most popular sights in Los Angeles, an official Los Angeles Cultural and Historical Landmark drawing more than 3 million visitors a year. The Farmers Market clock tower became an icon of the Farmers Market in 1948. It originally sat on top of a different building but was moved to its current location in 2002. Above the door of the original building was the phrase "An Idea," a tribute to Fred Beck, Roger Dahlhjelm, and the 18 original tenants created the icon at the corner of 3rd & Fairfax. Before there was a Farmers Market on this corner, Arthur Fremont Gilmore ran a dairy farm here. He was drilling for water when he struck oil. By 1905, the dairy herd was replaced by oil derricks. "Someday you will own a horseless carriage. Our gasoline will run it" the Gilmore Oil Company proclaimed in 1913. In 1948, Gilmore's son E. B. opened a "gas-a-teria" (self-service gas station) at 3rd & Fairfax. It was there until the early 1960s. These pumps pay tribute to the Gilmore family's part in the market's story. When you go to the Los Angeles Farmers Market, don't expect the organic, farm-to-market style of farmer's market you'll find in many California locations. Most of the produce looks more or less like this display. An online reviewer said it well: "This isn't a traditional farmer's market in the sense that produce and groceries are the main attraction." In fact, for a visitor, the Farmers Market experience is more about the cute little shops and especially about the food. The Farmers Market is one of the best places in town to get a reasonably-priced meal. You'll also find quite a few places in the market that have won awards for their cuisine, including Monsieur Marcel, the Gumbo Pot (Cajun) and others. We also like the wine bar in the center of the market for a laid-back time with a local clientele. One of the strong appeals of the Farmers Market is a feeling that it hasn't changed since it opened. You may wonder why we bothered to take a picture of these tables and chairs, but they're an integral part of the Farmers Market, looking like they've been around as long as the market has. Equally as charming are the market's shopping carts, with wooden, slatted sides and handle, but we'll let you discover them for yourself. A piece of raw, prime filet mignon may not be what you're looking to buy on your vacation, but it's interesting to know that after all these years, the Farmers Market still has some of the best butchers in town, according to LAist.com. DuPar's has been around almost as long as the market has, and it's open 24 hours a day. Their hotcakes are highly rated and they boast an extensive list of house-made pies. The menu is decidedly old-fashioned full of items like a turkey breast entree with gravy, stuffing (beneath turkey) and double sautéed veggies. Many people who like DuPar's praise their pancakes and the fact that it's open 24 hours a day. Those who dislike it complain about poor service and some say it's in need of better maintenance. The Grove at Farmers Market is an outdoor shopping and entertainment complex built next door to the historic Los Angeles Farmers Market. It's a California-style place, created to take advantage of the Southern California outdoor lifestyle. The design mimics a downtown shopping area in a small (but very upscale) town. At the center of The Grove is a landscaped park. In the center is a fountain created by the same designers who did the Bellagio Hotel fountain in Las Vegas. Its water-and-music show is choreographed to the music of artists such as Frank Sinatra and Dean Martin and plays every half-hour. A glockenspiel (musical clock) located on a nearby dome plays cute little tunes to mark the time and a bronze, classical-style statue called The Spirit of Los Angeles towers overhead. The Grove is a popular spot for shopping and dining, and its lively crowds and street-grid layout make it feel a little bit like an old-fashioned downtown. The historic Farmers Market and its modern counterpart work together so seamlessly that you might think it was all built at the same time. Most people go to The Grove for shopping and many of the shops are ones you might find in a high-end mall at home. They also have a large American Girl store (one of only a few in the U.S.), an Apple store, several restaurants and a movie theater.